Image of the Jubilaeum Pin given to two people from each parish to mark the 60th anniversary of the Archdiocese of Miami. Msgr. 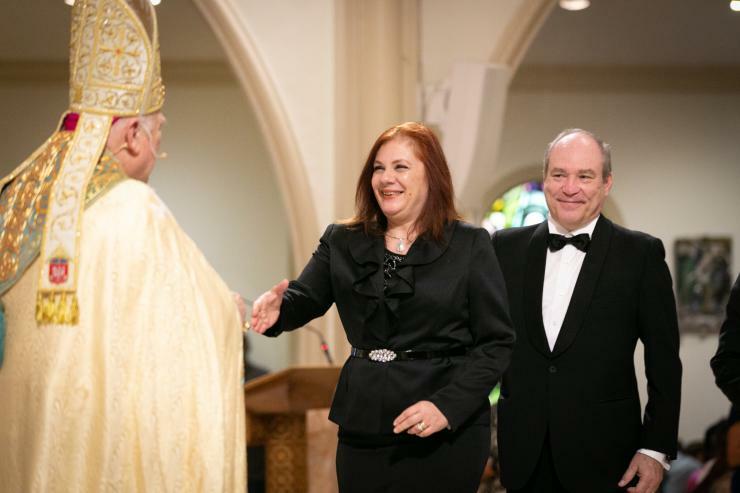 Jude O'Doherty, pastor of Epiphany Parish in Miami, and Sister Elizabeth Worley, archdiocesan chancellor for administration, greet an honoree before the vespers service. Father Bob Tywoniak of Blessed Sacrament Parish in Fort Lauderdale waits for the vespers to begin with his parish's honorees, Douglas Smalls and Christine Crepage. Honorees await the start of the 60th anniversary vespers. 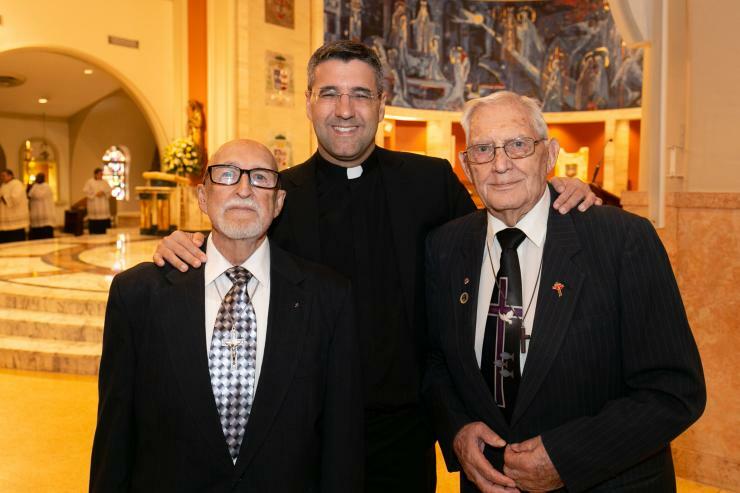 Father Manny Alvarez, pastor of Immaculate Conception in Hialeah poses with the Jubilaeum Pin recipients from his parish, Andrew Izzo and Guillermo Gomez. Archbishop Thomas Wenski follows Auxiliary Bishops Peter Baldacchino and Enrique Delgado into St. Mary Cathedral for the vespers service marking the 60th anniversary of the Archdiocese of Miami. (MARLENE QUARONI | FC) Archbishop Thomas Wenski delivers his message to honorees at the 60th anniversary vespers for the archdiocese. 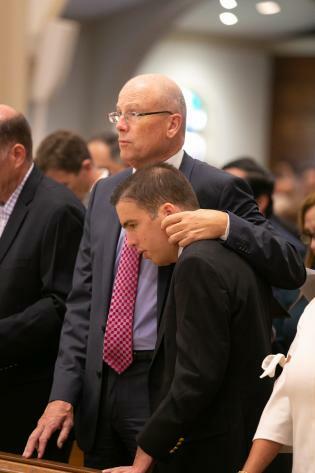 Sean Clancy, Primum Regnum Dei recipient from St. Joseph parish on Miami Beach, takes part in the vespers with his son. 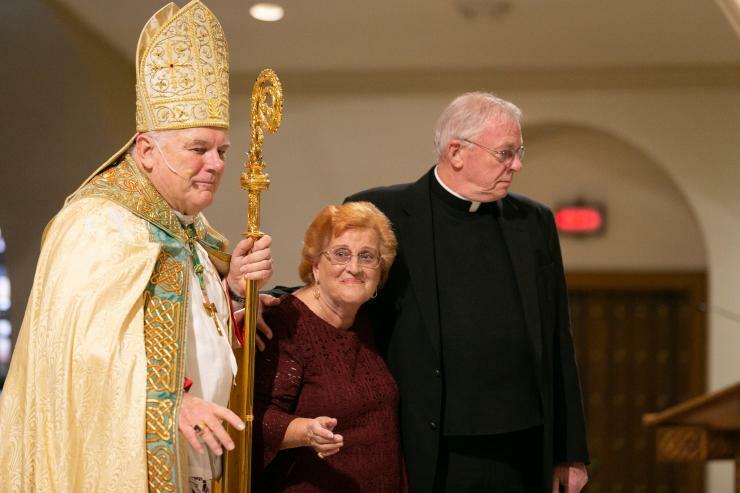 Father Randall Musselman, pastor of All Saints Parish in Sunrise, accompanies his parishioner, Antonia Ignaccolo, to receive her Jubilaeum Pin from Archbishop Thomas Wenski. 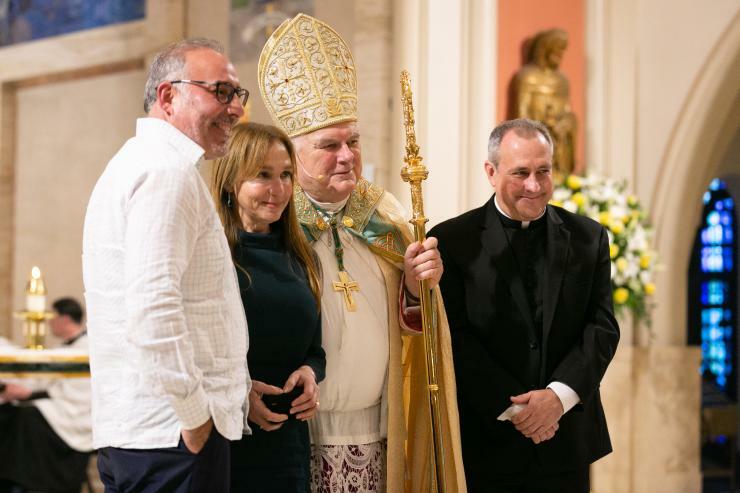 Jesuit Father Eduardo Alvarez, pastor of Gesu in Miami, accompanies his parishioners, Joel Angouand and Silvana Teresa Obregon to receive their Jubileaum Pin from Archbishop Thomas Wenski. Father Fernando Heria, rector of the Shrine of Our Lady of Charity in Miami, accompanies his parishioner, Ondina Menocal, to receive her Jubileaum Pin from Archbishop Thomas Wenski. Marilyn and Andres Salani of Our Lady of Guadalupe Church in Doral go up to receive their Jubileaum Pins from Archbishop Thomas Wenski. Sharon Brauer of Our Lady of the Holy Rosary-St. Richard in Cutler Bay receives her Jubileaum Pin from Archbishop Thomas Wenski. 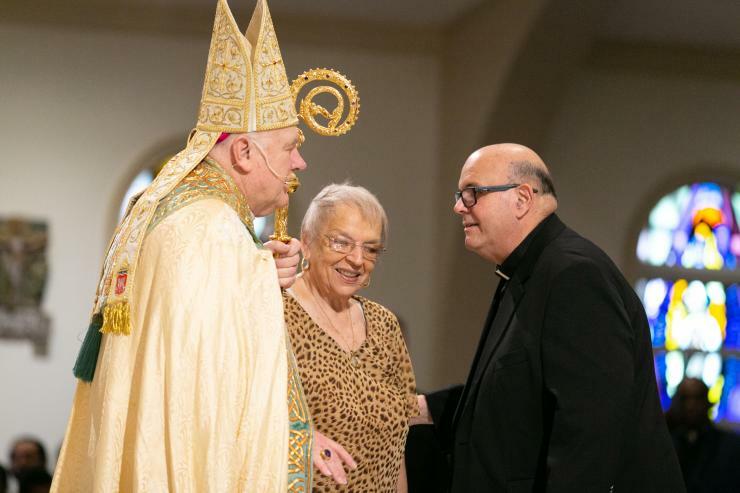 Archbishop Thomas Wenski gives Maryann Don of San Pablo Parish in Marathon the Jubilaeum pin as her pastor, Father Luis Perez, stands beside her. 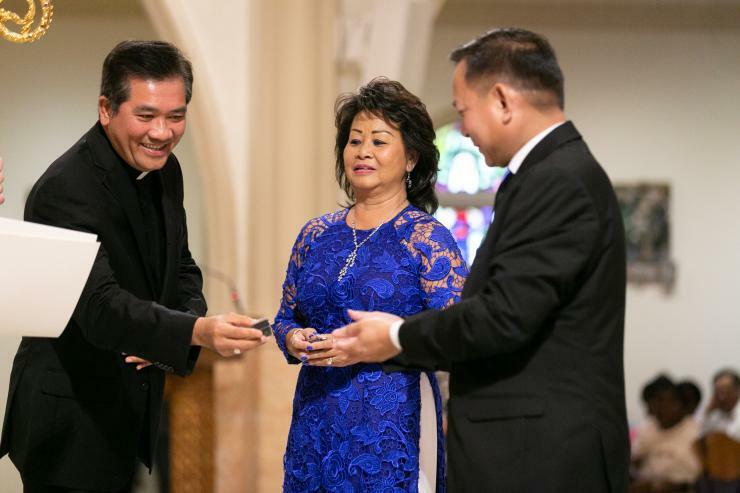 (MARLENE QUARONI | FC) Father Long Nguyen, administrator of Our Lady of La Vang Vietnamese Mission, gives Jubileaum pins to his parishioners, from left, Lien Quach and Tuong Ho. 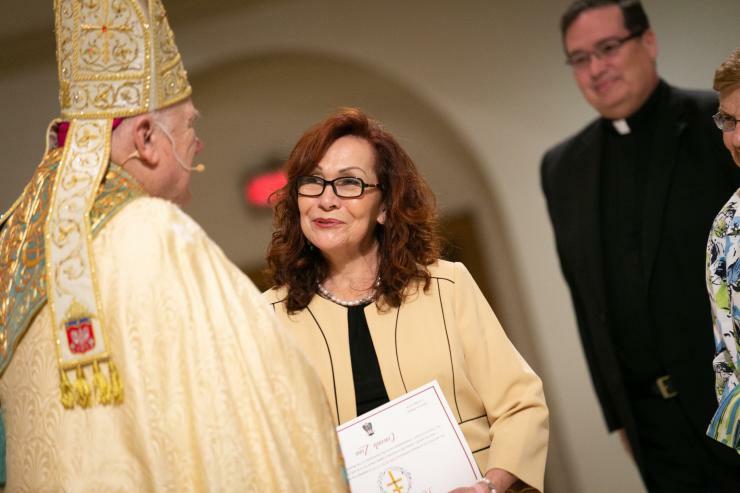 Father Omar Ayubi, parochial vicar at Our Lady of Lourdes in Miami, accompanies Anne Santos to receive her Jubilaeum Pin from Archbishop Thomas Wenski. 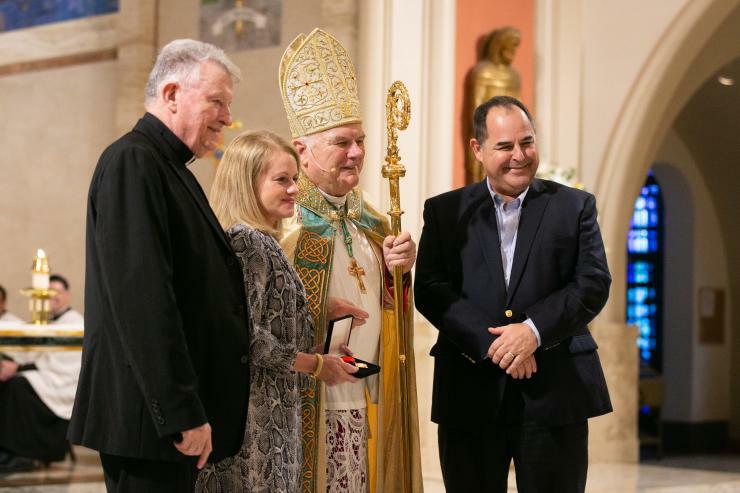 Father Kenneth Whittaker, pastor of Our Lady of Mercy in Deerfield Beach, accompanies Lucy Guerasio to receive her Jubilaeum Pin. Father Carlos Vega, pastor of St. Bernard in Sunrise, accompanies Conzuelo Zona to receive her Jubilaeum Pin from Archbishop Thomas Wenski. 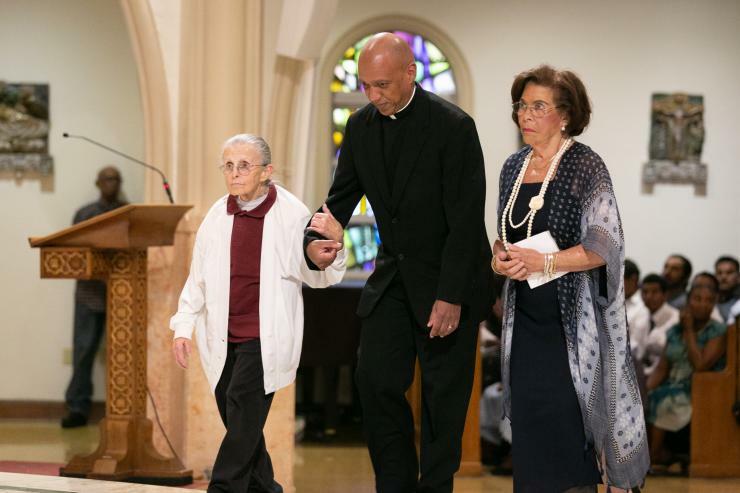 Father Miguel Sepulveda accompanies his parishioners, Shirley Capra and Eva Gonzalez to the sanctuary to receive their Jubilaeum pins. 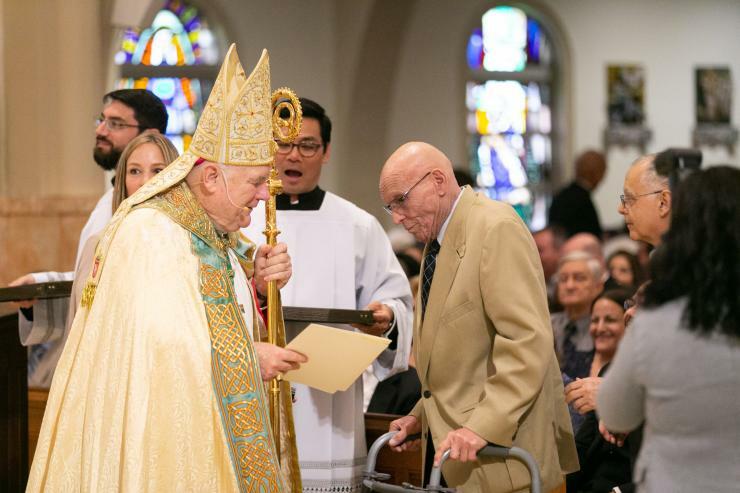 St. Catherine of Siena Jubileaum recipient Lou Huertas, a founding member of the parish, greets Archbishop Thomas Wenski. 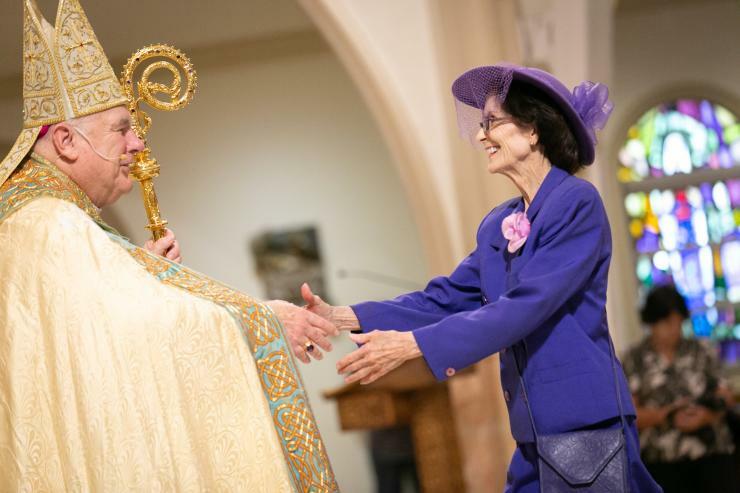 Rose Preseau, 101, leaves the sanctuary after being greeted by Archbishop Thomas Wenski. 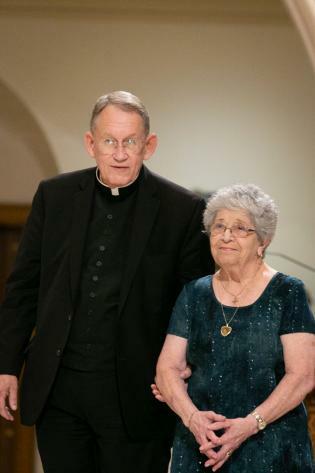 She is accompanied by fellow Jubilaeum honoree John Frink and her pastor, Father Steve O'Hala. 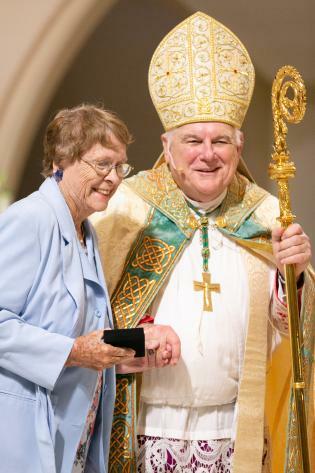 Ruth Dunnigan, Jubileaum recipient from St. Gabriel Church in Pompano Beach, greets Archbishop Thomas Wenski. 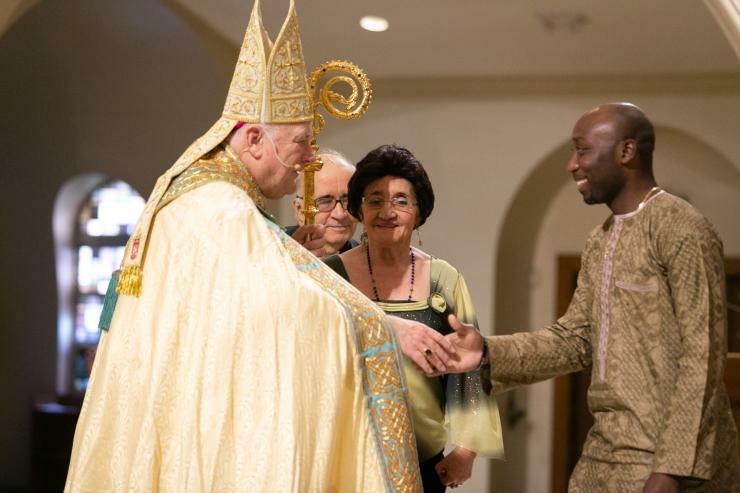 St. Mary Cathedral gift shop volunteer Elba Barreto, 92, and Wilsonne Mondesir receive their Jubileaum awards from Archbishop Thomas Wenski as their pastor, cathedral rector Father Christopher Marino, stands behind them. 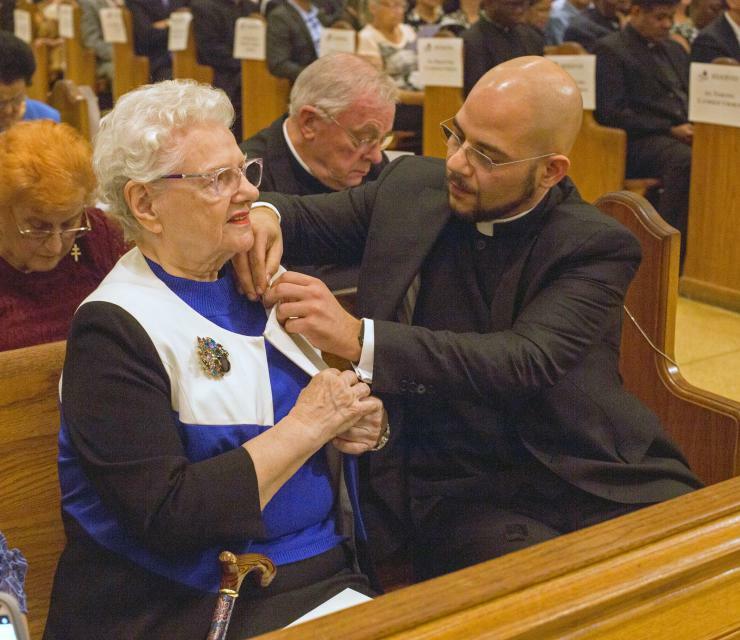 (MARLENE QUARONI | FC) Father Luis Rivero, St. Jerome Church pastor, pins the Jubilaeum award on his parishioner, Helen Seufert. 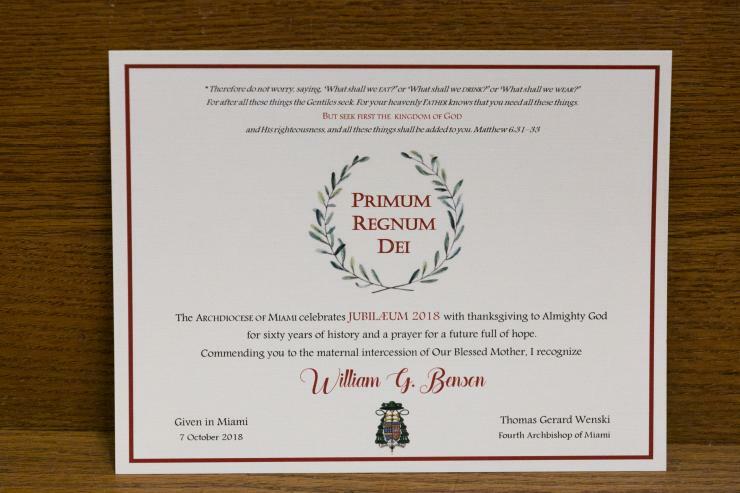 (MARLENE QUARONI | FC) The Primum Regnum Dei award certificate given to William Benson of St. Gregory the Great parish in Plantation. Msgr. Jude O'Doherty, Epiphany pastor, accompanies Primum Regnum Dei recipient Thomas E. Beier and his wife, Lynn, to the sanctuary to receive the award. 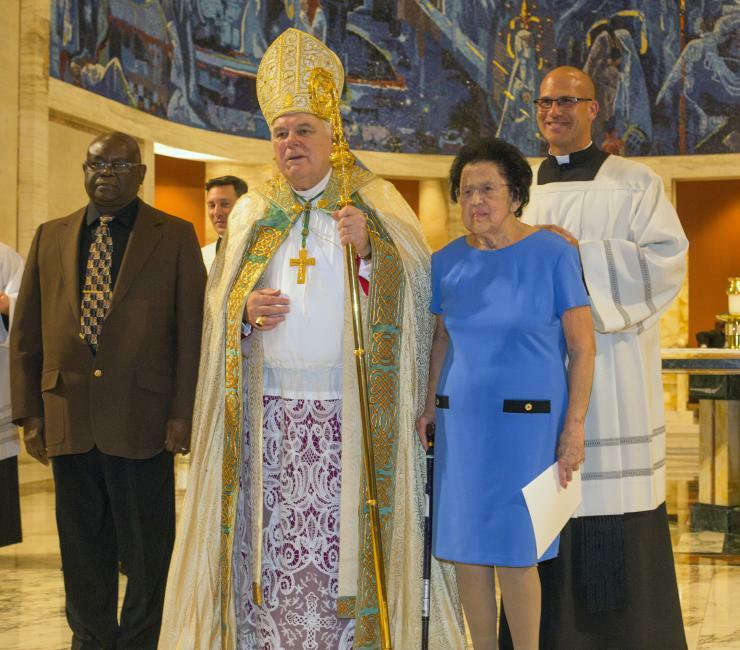 Primum Regnum Dei recipient William G. Benson and his wife, from St. Gregory the Great parish in Plantation, to the sanctuary to receive the award. 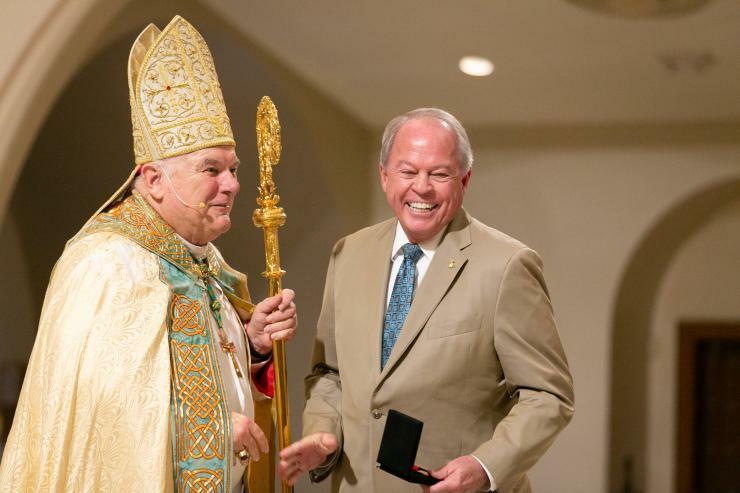 Ralph Lawson, chairman of the board of Catholic Health Services, receives his Primum Regnum Dei medal from Archbishop Thomas Wenski. Primum Regnum Dei recipient Sean Clancy of St. Joseph parish, Miami Beach, poses with Archbishop Thomas Wenski and his pastor, Father Juan Sosa. Father Jose Alvarez, Our Lady of the Lakes pastor, and Archbishop Thomas Wenski pose with the Primum Regnum Dei recipients from the parish, Alicio and Nirma Pina. Msgr. Jude O'Doherty, Epiphany pastor, and Archbishop Thomas Wenski pose with the Primum Regnum Dei recipients from the parish, Charlie and Maria Arazoza. Archbishop Thomas Wenski poses with the Primum Regnum Dei recipient from Visitation parish, Mary De Biase. MIAMI | They were no longer unsung heroes — and there were more than 200 of them. 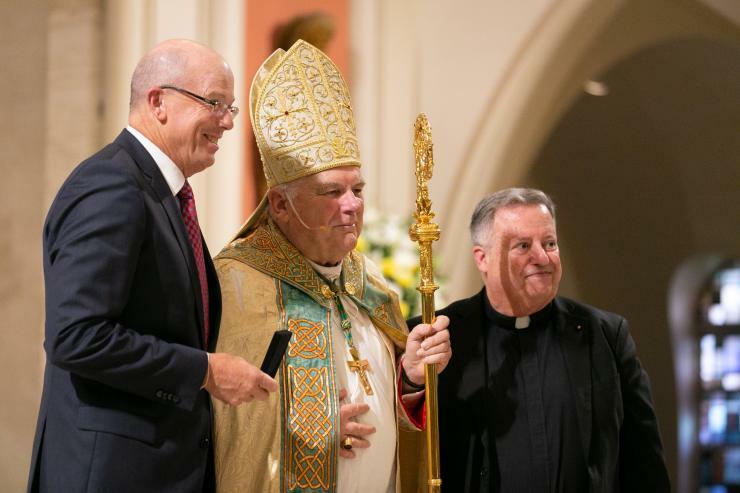 Some of the archdiocese’s most faithful laity gathered Oct. 7 at St. Mary Cathedral to receive a special award for their decades of service. 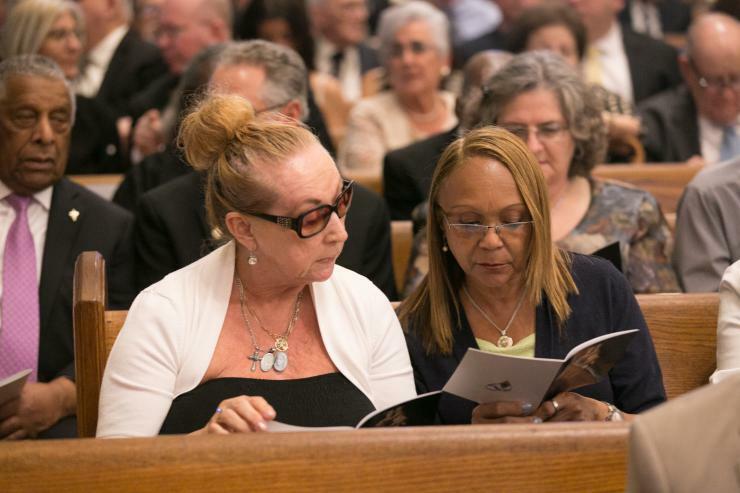 The event was a Vespers — evening prayer — service for the 60th anniversary of the archdiocese. 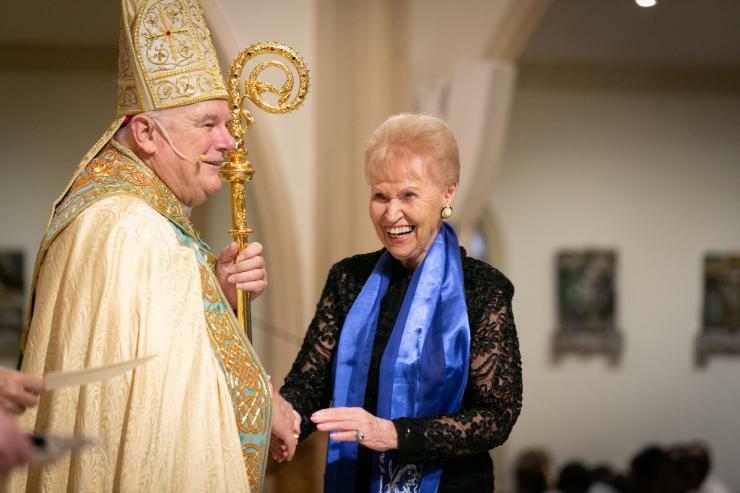 Coming from every corner of the archdiocese — from northern Broward to Key West — they included ushers, sacristans, catechists, extraordinary ministers of Communion and parish office volunteers. Some ran food banks, led Emmaus retreats, served donuts after Mass, and did myriad other tasks. The Vespers service actually served triple duty. 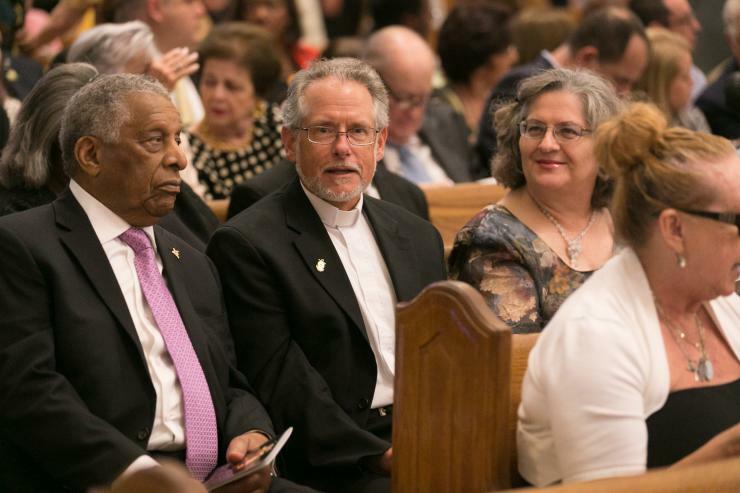 It was one of several events during the year to celebrate the six decades of the local Church, starting with creation of the Diocese of Miami in 1958. 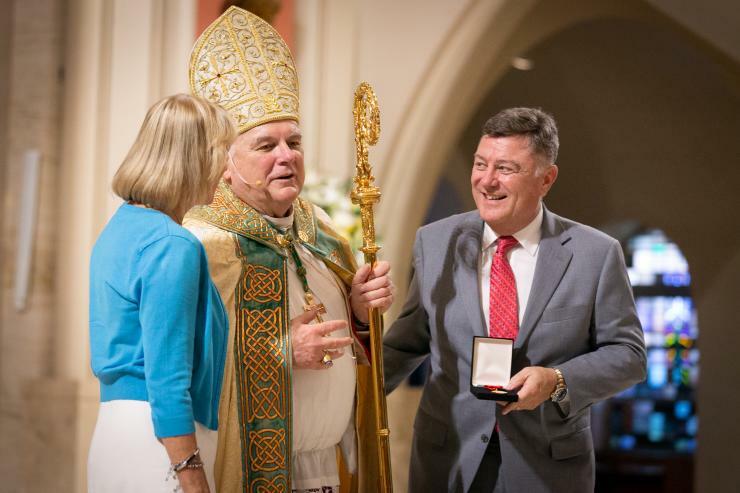 The service was also an occasion for Archbishop Wenski to confer the archdiocese’s highest honor, the Primum Regnum Dei award. The gold medal, showing a palm tree flanked with crosses, went to six individuals and two couples. The Jubilaeum was different: It was given to two people in each parish, nominated by their pastor for their service at the local level. 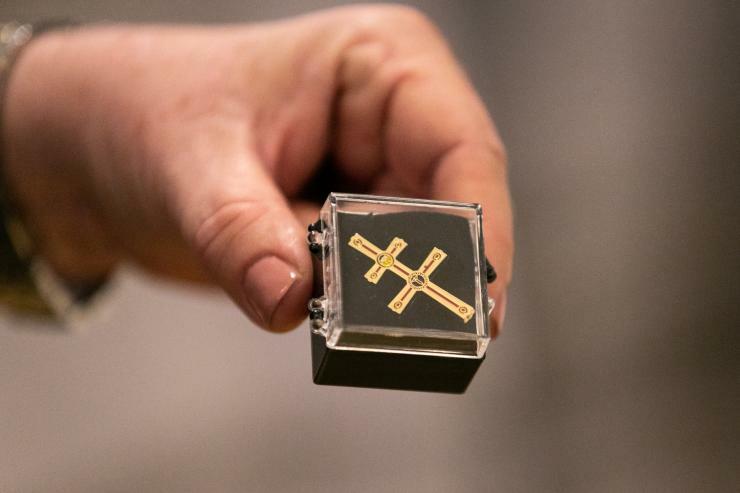 Each red-and-gold Jubilaeum pin is shaped like the medieval two-barred cross signifying the authority of the bishop. Nearly 900 honorees and their families packed the cathedral. To organize them, most pews were marked with the names of the parishes. Guiding them to their seats were students from all three area seminaries: St. Vincent De Paul Regional Seminary, near Boynton Beach, and St. John Vianney College Seminary andRedemptoris Mater, both in Miami. Archbishop Thomas Wenski delivers his message to honorees at the 60th anniversary vespers for the archdiocese. 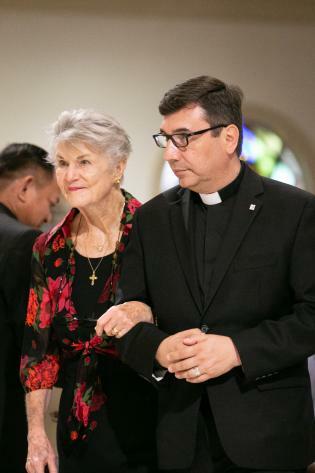 The unsung heroes of South Florida's parishes - two from each church - were honored on the 60th anniversary of the Archdiocese of Miami, during a vespers service Oct. 7, 2018 at St. Mary Cathedral. Nearly 900 people attended the event, where Archbishop Thomas Wenski presided. The service took on the air of a toned-down college commencement. As recipients’ names were called, they approached the sanctuary with their pastors. Each received a certificate, posed for a photo with the archbishop, then descended to receive the Jubilaeum pin or Primum Regnum Dei medal. 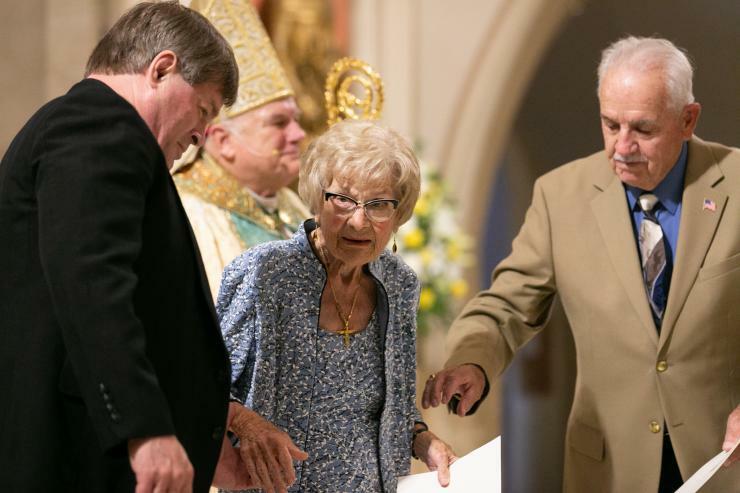 But at one point, Archbishop Wenski stopped and announced, “This lady is 101 years old!” — and all eyes fixed on Rose Preseau of St. David parish, Davie. Preseau said later that she has served in just about every committee at St. David since its founding in 1974 — and she doesn't plan to stop. Despite the lengthy process of calling each recipient to the sanctuary, the crowd maintained the solemnity of the occasion, with hardly anyone speaking above a murmur. 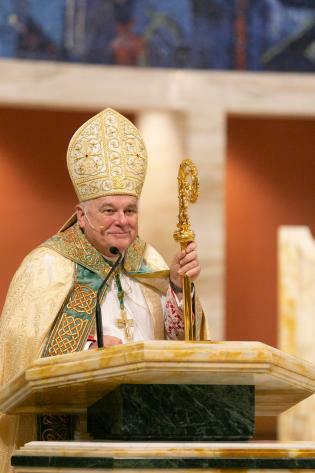 He then outlined a brief history of the diocese, starting with its 1958 founding by the late Bishop Coleman F. Carroll, who also oversaw its reassignment as an archdiocese a decade later. He noted the growth of the local Church to nearly 1.5 million members today. Archbishop Wenski also held up the archdiocese’s cultural and ethnic diversity as a model for the surrounding community. “In these times of great divisiveness and polarization in our society and world, may we Catholics, model in our parishes, organizations and apostolic movements what a reconciled and reconciling world should look like,” he said. But the idea of a universal Catholic Church is abstract without parish life, he acknowledged — a life fostered and nurtured by the service of laity like those being honored at the Vespers. 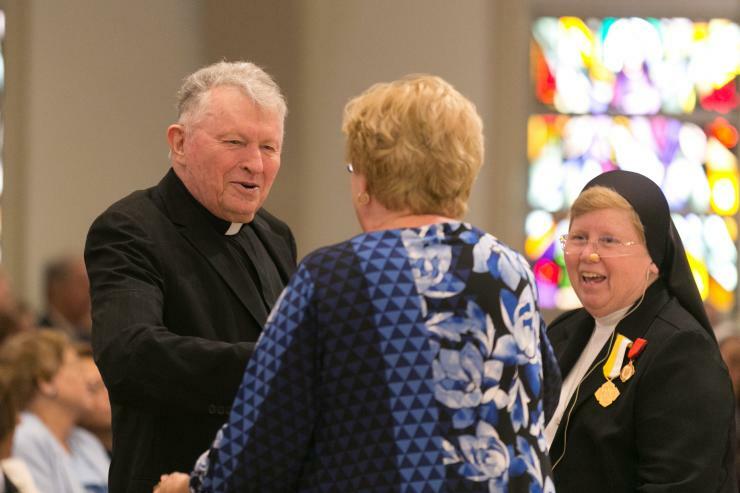 “While you rightly deserve it, you are being honored not because you are necessarily any different from the rest of the laity of our archdiocese, but because you are representative of all of them, of their dedication and their devotion,” he said. After final prayers and canticles, Archbishop Wenski thanked everyone again, then announced that prints of the photos were already available in the cathedral narthex. “That shows I'm a good steward — I saved money by not sending them through the post office,” he added, drawing more laughs. Many of the honorees said they were shocked and humbled at being chosen for the awards. Typical was Karen Bruener, who serves as a catechist, with the Ladies Guild and the prayer ministry at Blessed Trinity Church in Miami Springs. After getting their photos, the honorees went to a reception on the broad patio in front of the cathedral. Some were already wearing their Jubilaeum pins. Gathering at round tables draped with white cloths, they noshed on sliders, croquetas, skewered mozzarella and cherry tomatoes, Cuban finger sandwiches, and a variety of ceviches in tiny glasses. They washed it all down with water, soda, or red or white wine. Those attending received a final gift: a 60-page history of the archdiocese, with color photos showing parishioners from India, Cuba, Haiti and elsewhere. 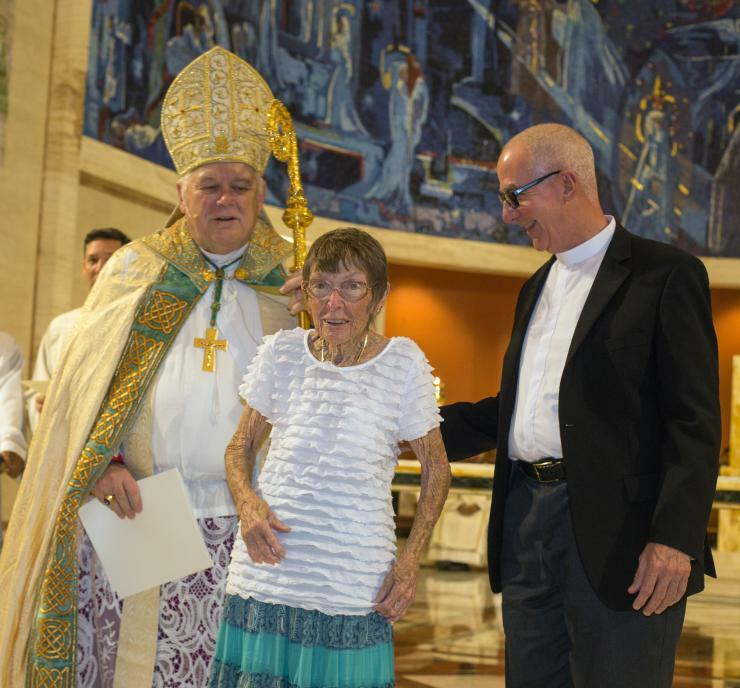 Rose Preseau, 101, leaves the sanctuary after being greeted by Archbishop Thomas Wenski. She is accompanied by fellow Jubilaeum honoree John Frink and her pastor, Father Steve O'Hala. 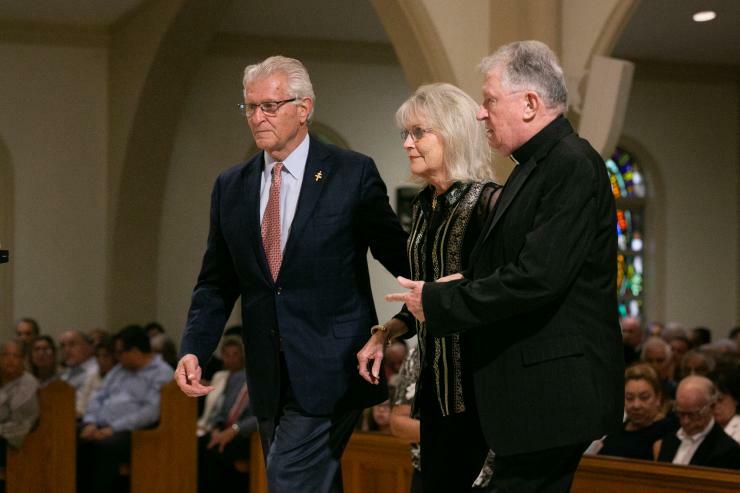 The unsung heroes of South Florida's parishes - two from each church - were honored on the 60th anniversary of the Archdiocese of Miami, during a vespers service Oct. 7, 2018 at St. Mary Cathedral. 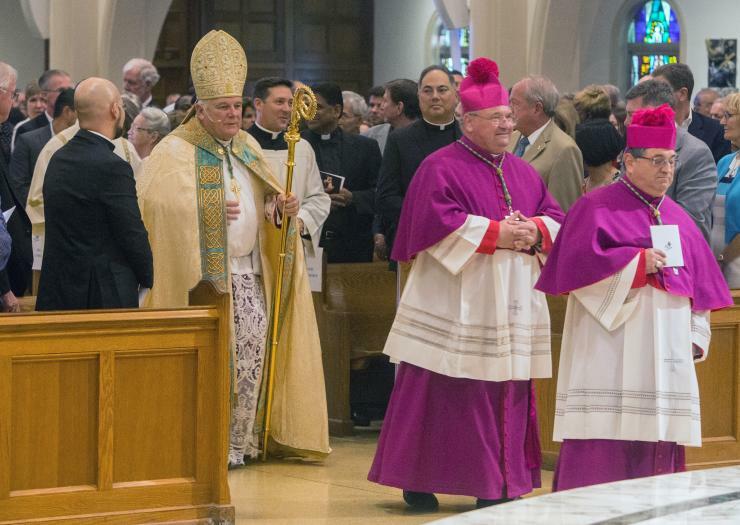 Nearly 900 people attended the event, where Archbishop Thomas Wenski presided.